We often take electricity for granted. Since the late 19th century, the widespread use of this infinitely versatile resource has led to it being considered as the “backbone of modern industrial society”. Yet its use comes at a cost because virtually everything which uses electricity as a source of supply has the potential to cause fire. In a typical building, this encompasses the fixed wiring installation – incoming supply point, distribution system, accessories such as socket outlets and all interconnecting wiring – and all equipment and appliances connected to such. In the UK alone there are, on average, 25,000 fires a year where electricity can be considered as the source of ignition and such fires can have devastating consequences. In April 2015, Clandon Park House – an 18th century heritage mansion property belonging to the National Trust – was razed to the ground by a fire which began in an electrical distribution board, located in the basement. To date, the total insurance claim amounts to £150 million. For ignition to be from an electrical source, two conditions need to be satisfied. Firstly, the electrical wiring, equipment or component must have been energised. Secondly, sufficient heat must have been generated to cause ignition of an adjacent combustible material. But how is this heat generated? A heating effect will be experienced in any electrical circuit when a load is applied but, if the circuit has been correctly designed and installed, the heat generated in normal circumstances will be insufficient for it to pose a threat. So, what causes the circuit in question to behave “abnormally”, to have the capability of producing excessive heat and become a source of ignition? Overloading the circuit and causing a current in excess of the rated capacity of the conductors is one obvious example but a relatively rare one, given that circuit protective devices such as circuit breakers should operate to disconnect the supply well before the point of ignition. However, it is worthy of note that the standards to which fuses and circuit breakers are manufactured means that it is entirely plausible for an overcurrent to exist without these protective devices operating. Arcing, whereby a high temperature luminous electrical discharge occurs across a gap, is only really a concern within larger polyphase electrical installations. In spite of the very high temperature of an arc path, arcing is so brief and localised that it may not be sufficient to ignite adjacent combustibles. High voltage arcs are considerably more dangerous – for example, a lightning strike can cause a voltage surge within an electrical installation and result in numerous arcs of varying intensity and duration. Serious consideration should be given to the installation of surge protection to protect against such occurrences in regions of intense lightning activity. Arguably, the major cause and area of concern when it comes to the generation of unwanted heat within electrical installations is localised resistive heating. The most likely cause of this is an imperfect contact between connections which means increased resistance to current flow which, in turn, generates heat. When a copper conductor is heated in the presence of oxygen, a thin layer of oxide is formed on the outer surface and, as copper oxide is an electrical insulator, resistance increases. What follows is a vicious circle of increasing heat and resistance until such time that thermal runaway occurs – the heat being generated simply cannot be dissipated quickly enough. The problem with this phenomena is that the heat is confined to a relatively small area – the “oxide interface” – and can result in what is termed a “glowing connection” whereby the conductor becomes hot enough to glow. If combustible materials are close enough to this hot spot they can be ignited. Similarly, if the process continues unabated, resultant temperatures in excess of 1300˚C can be experienced – at which point molten material is ejected from the connection, igniting combustibles further afield. In a standard low voltage electrical installation, it is likely that the wiring will have PVC insulation. As an intrinsically rigid material, PVC requires plasticizer to be added to it in order to make it flexible enough to be used for this purpose. This has an adverse effect upon the PVC in as much that the temperature required to ignite it is significantly reduced, being in the order of 250 – 450˚C depending upon composition. What it also means is that the plasticizer is effectively lost through the process of dehydrochlorination if the operating temperature of the conductor exceeds 100˚C or so, causing the insulation to become brittle and charred. Hence, it would not be unreasonable to consider this PVC insulation as the primary fuel source for such types of electrical fires. Subsequent to an initial investigation which began in 2010, London Fire Brigade have since expressed serious concerns regarding what appeared to be a rapid increase in the number of house fires involving consumer units (domestic fuse boards). 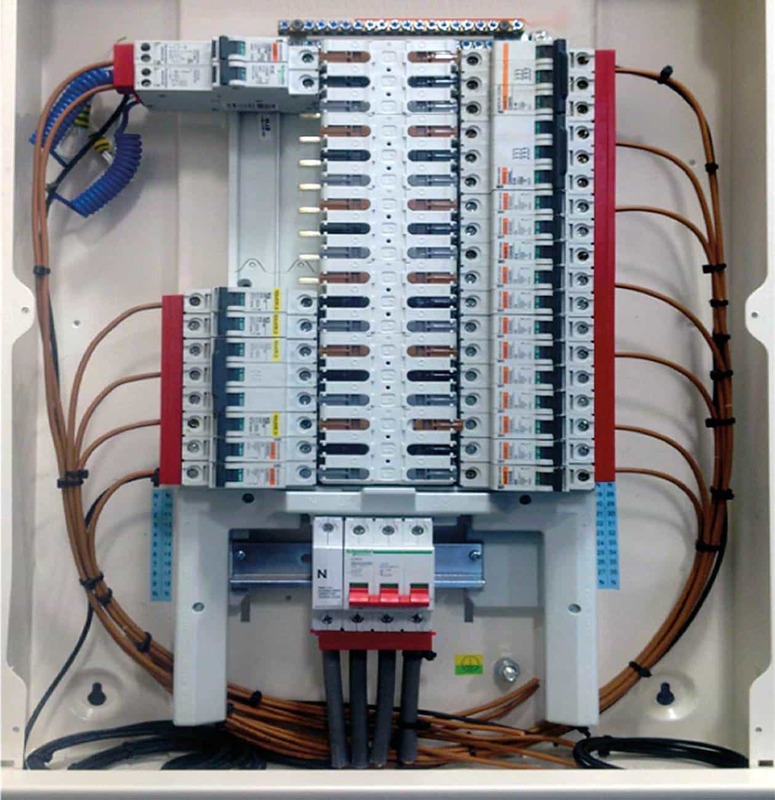 The end result was a change to BS 7671 (the UK “Wiring Regulations”) meaning that, as from the beginning of 2016, consumer units installed within domestic premises had to have their enclosure manufactured from a non-combustible material or be enclosed in an enclosure constructed of non-combustible material. The aim of this new regulation is to better contain the effects of any resultant fire which, whilst laudable, doesn’t actually address the cause of such fires. Would it not be far simpler to prevent these fires from happening in the first place? As an industry, our collective focus tends towards post-ignition, an acceptance that, as fires are somewhat inevitable, we need to minimise their impact through early detection, containment and suppression. Surely, our first thought ought to be prevention. Of course, the idea of inspecting electrical installations and equipment for abnormal heating effects isn’t new, given that we’ve been using thermal imaging – and ultrasonics – as a diagnostic tool for many years. However, these only offer a “snapshot” view, a particular moment in time which may not actually accurately reflect normal operating conditions – especially in installations where loadings are cyclical. In an ideal world, we would be able to combine the heat sensing capabilities offered by thermography with a notification system, all on a permanently installed basis. We would then be instantly aware of any overheat event within the electrical installation which could be investigated and dealt with long before it escalated into an emergency response. It sounds ideal but can it be done? Fortunately, the answer is yes. A recent advance in the fight against the scourge of electrical fires means that a pre-ignition solution to the problem now exists, by way of a thermal monitoring system capable of detecting excessive heat generated by electrical connection points and components. The way in which it works is simple yet effective. The heat sensing element is a miniature thermal switch which operates at a temperature well below that at which there is any risk of ignition but above that at which the installation operates in normal conditions, thus avoiding nuisance activations. Because of its size it can be installed as close as is physically possible to those points it needs to monitor, optimising the chances for earliest possible detection. Unlike many other thermal switches it is non-resettable meaning that the overheat event has to be investigated and the fault rectified before any associated notifications can be accepted or cleared. The thermal switch component itself is normally open circuit and closes at a set temperature. It is this change of state that can be used for signalling purposes and allows it to utilise existing fire alarm and building management systems as the means of notification. Of course, any overheat event being notified in this manner still requires human intervention – to investigate the cause. Where this particular innovation really comes into its own is in its inherent capability to automatically isolate electrical circuits. 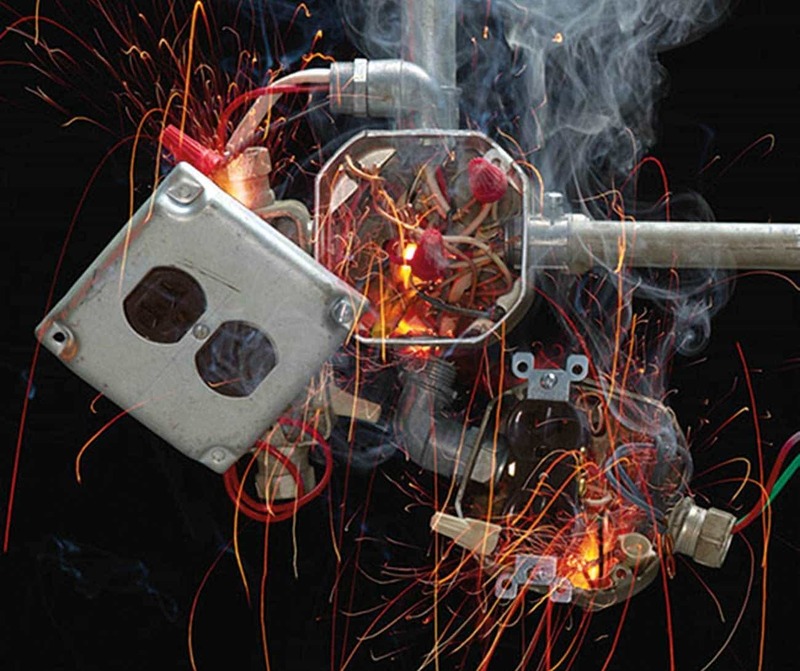 It does this by working in tandem with any Residual Current Devices (GFCI) present on the electrical supply side, simply by operating them when excessive heat is detected and, by doing so, eliminating the risk of ignition. In terms of applications, it is extremely versatile as the underlying principle – that of detecting unwanted heat and communicating the fact – remains the same, regardless of the size of the electrical installation or equipment it seeks to protect. Surely, in an age where the technological advancement is such that we are now seriously considering a manned mission to Mars, we should turn our attention to employing technology to solve one of our more earthly problems – fire.